Of the forty-eight missions the 384th Bomb Group flew in 1943, twenty-five crewmen were declared missing in action during those six months and their bodies never found. Their names are etched in the Tablets of the Missing in Cambridge (England), Margraten (The Netherlands), and Henri-Chappelle (Belgium). The 384th Bomb Group flew two hundred seventeen missions in 1944. For the entire year 1944, only fifteen crewmen were declared missing with their bodies never recovered. Keep in mind, many more men were at one time declared missing, but some of those became POWs, or evaded capture, or were declared killed in action. Donald Ivan Collins, ball turret gunner on his twelfth mission with the Joseph R. Herbert crew aboard Wabbit Twacks. The target was a submarine facility at Wilhelmshaven, Germany. Collins “fell through” the ball turret at 12,000 feet over enemy territory. He was not wearing a parachute. He is listed on the Tablets of the Missing at Cambridge American Cemetery, Cambridge, England. Merlin Reed (pilot on his nineteenth mission), Peter Gudyka (navigator on his twenty-first mission), and Robert O. Johnson (engineer/top turret gunner on his sixteenth mission) were aboard Silver Dollar. The target was the Heinkel Aircraft Plant in Oranienburg, Germany. Bombs from the 379th Bomb Group (the high group) fell onto Silver Dollar, knocking the tail completely off in front of the stabilizer. The aircraft dived straight down into a spin with all four engines running. Only two of the crew managed to escape from the aircraft. Other than the three missing men, five more of the crew were killed when the plane struck the ground about one-half mile from the southern outskirts of Berlin. John Plotz, the waist gunner who parachuted down and landed about one hundred yards from the plane, wrote that the plane was completely demolished by the impact and an explosion. [You can read about the ball turret gunner’s amazing escape from Silver Dollar here]. Reed, Gudyka, and Johnson are listed on the Tablets of the Missing at Netherlands American Cemetery, Margraten, The Netherlands. James Wesley Brown (pilot on his fourth mission), Donald Vernon Chubb (co-pilot on his third mission), Kenneth Myron Jones (navigator on his third mission), Merle Ernest Ingmire (engineer/top turret gunner on his fourth mission), Joseph John Kozar (radio operator on his third mission), James Augustine Hatton (ball turret gunner on his third mission), and Julius Eugene McClintick (waist gunner on his third mission) were aboard aircraft 42-97081. The target was a Crossbow (V-weapon) service bunker in Sottevast, France. The aircraft was struck by flak immediately after the bomb run, peeled out of the formation, and headed for England. The crew had to ditch in the English Channel thirteen miles off the French coast on the return trip back to Grafton Underwood. The bombardier and tail gunner were rescued, but the rest of the crew did not survive. Shortly after the bomb run, flak struck the No. 4 engine and then the No. 1 engine. Both engines cut out. The Nos. 2 and 3 engines were working all right. The No. 4 engine caught fire and the crew considered bailing out. The next burst of flak hit the tail wheel, knocking it off. The oxygen system was also knocked out. But after a check with everyone on the interphone, no one had been wounded by the flak. Another burst of flak struck the left wing between the Nos. 1 and 2 engines and almost tore it from the aircraft. It was held on only by about 1 1/2 feet of the leading edge and about 1 foot of the trailing edge. The Engineer called and reported that there was fire between Nos. 1 and 2 engines in the main gas tank. The bombardier jettisoned the bombs to reduce the weight of the aircraft. The pilot peeled out of formation to the left and headed for the English Channel. The fire in the No. 4 engine was extinguished and the crew believed they could make it back. Because of the lack of oxygen, they were forced down to 13,000 feet. However flames continued to shoot out of the left wing and it became clear they could not make it back. The interphone became inoperative by the time they reached the Channel, and the pilot gave the signal to bail out about 1905 hours. The tail gunner, Yeager, reported he was the seventh man to leave the ship. When he got into the water he had some difficulty in getting rid of his chute, as one side of it stuck. However, he finally got it off. He pulled the cords on his Mae West and it inflated and then deflated. He began swimming about. He did not see any of the others after he landed in the water. The bombardier, Kuba, reported that he followed the navigator out of the plane as the eighth chute out. He delayed opening his chute to prevent drifting too far away from the rest of the crew. He pulled one side of his Mae West and when he hit the water, got rid of his chute. Yeager reported an explosion in the aircraft when it was about five to six hundred feet above the water. It went into a dive and then hit the water and sank. It came back up and another explosion occurred and it began burning, staying afloat for about four to five minutes. According to Yeager, neither the Pilot or Co-Pilot bailed out. A Spitfire dropped Kuba a dinghy, but he could not reach it, as it was about four to five hundred yards away. His clothing kept him warm and dry for awhile, but as the water successfully penetrated each garment, he discarded it. His fingers became numb and he was unable to remove his coveralls. About 2045 hours Yeager was picked up by Air/Sea Rescue. Kuba reported he was in the water for about one and one-half hours and was picked up by Air/Sea Rescue. He was informed by Air/Sea Rescue that all of the crew except two had died of exposure. Waist gunner Donald E. Reis, who died of exposure, was the only body recovered. The other seven crewmen unaccounted for were also presumed to have died of exposure. James Wesley Brown’s name is listed on the Tablets of the Missing at Ardennes American Cemetery, in Neupré, Belgium. Donald Vernon Chubb’s name is listed on the Tablets of the Missing in Normandy American Cemetery, Colleville-sur-Mer, France. James Augustine Hatton, Merle Ernest Ingmire, Kenneth Myron Jones, Joseph John Kozar, and Julius Eugene McClintick are all listed on the Tablets of the Missing at Cambridge American Cemetery, Cambridge, England. Thomas Rex Francis, pilot on his fourth mission, aboard aircraft 42-97404, (possibly named Little Mike). The target was an aircraft assembly components factory in Poznań, Poland. The formation was under enemy aircraft attack when Francis pulled out of the formation to the left. He was seen circling under control, but with fires under the inboard sections and both wings. One of the crew reported that the German interrogator at Dulug Luft told one of the crew that Francis had been killed, but the interrogator offered no details. From out of the sun, the Me-109s cut through the flight path. In the top turret, I could follow their path around our formation and I spotted two fighters peel off and enter our air space. I called for Pallandino (left waist gunner) to spot his target. I opened fire and followed the 109 across my horizon. Petrillo (right waist gunner) opened fire, but the fighter escaped the barrage of lead. Two more entered the fray. The second 109 hit the plane ahead, (Chas. Baker aircraft) the cabin exploded and the ship did a complete loop, over and out of formation. Tom Francis, (pilot) pulled up, trying to miss the flaming debris. Another German cut in front of us and placed a shell in our left wing. Our Fortress shook and the wing burst into flame. Tom called out he had lost control and to abandon ship. Francis attended the A&M College of Texas (now Texas A&M University) as a member of the class of 1940 majoring in Agricultural Engineering. He graduated from Cadet School at Brooks Field in September 1942 and was commissioned as a Second Lieutenant. He was the pilot on a B-17 named “Little Mike” after his son, Michael. The plane was shot down and the crew, except Lt. Francis, captured. No one in the crew knew what had happened to Lt. Francis. German interrogators told the co-pilot during his interrogation that they had shot Francis. There was some doubt in the co-pilots mind that this happened as the Germans were trying to intimidate them to extract information on the flight. The crew returned to the United States a little over a year after their capture. Thomas Rex Francis is listed on the Tablets of the Missing at Netherlands American Cemetery, Margraten, The Netherlands. Lee White Dodson (pilot on his thirty-fourth mission) and William Conrad Koch (navigator on his first mission), aboard aircraft 43-38213. The target was the Leuna Synthetic Oil Refinery in Merseburg, Germany. The anti-aircraft fire was intense and accurate, with continuously pointed fire and barrage employed. 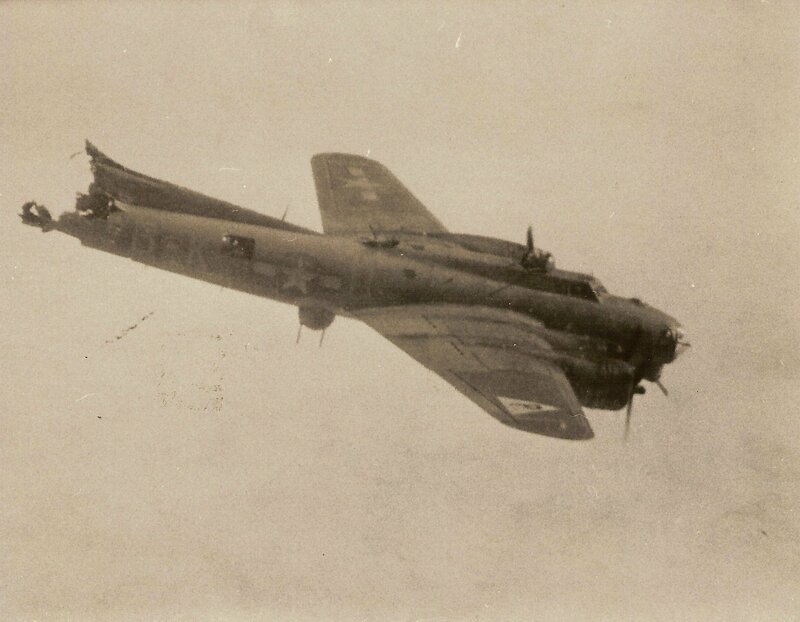 The aircraft was damaged by flak, and was observed going down in flames immediately after bombs away. Later the aircraft was noted to fall apart into three sections (the left wing and tail snapped off). It was afire, went into a spin and a steep dive, and exploded. The pilot and co-pilot were observed slumped over their seats. Two crewmen were killed, five became POWs and Dodson and Koch remained missing in action. The co-pilot, who had been reported slumped over his seat, was blown out of the plane by the explosion and did survive. Dodson, the pilot, had numerous flak wounds in his left side. He ordered the crew to bail out and then said “Let’s get the hell out of here.” German guards reported that Dodson was found in the wreckage underneath the #2 engine. However, he was burned beyond recognition and his dog tags were missing. The crew member reporting this information believed the guard was entirely truthful as he was shown the dog tags of other crew members. Koch, the navigator, was apparently unable to exit the aircraft or was knocked unconscious when the plane exploded. The bombardier, who was rendered unconscious and knocked out of the nose by the explosion reported that Koch was just next to him at the time of the explosion. He probably never recovered consciousness or else had his chute torn from him. Lee Dodson only had one more mission to go to complete his tour. William Koch did not return from his first mission. Lee Dodson and William Koch are listed on the Tablets of the Missing at Henri-Chapelle American Cemetery, Henri-Chapelle, Belgium. Thomas Earl Raught, ball turret gunner on the Elmer Nelson crew, on his thirty-first mission aboard aircraft 42-107083. The target was a bridge in Altenahr, Germany. The aircraft received a direct flak burst two minutes after attacking the secondary target, the railroad marshalling yards in Koblenz, Germany. The burst hit behind the ball turret and completely disengaged the tail assembly. After the tail section broke off, the plane plunged to earth. The aircraft crashed near Mühlbach, Germany, (near Arenburg). Other than Raught, six of the crew were killed and two became POWs. The amount of destruction to the aircraft was described as 99 1/2 percent. About ten minutes after bombs away we were hit with flak in the waist section of the ship, resulting the the outer wing panels dropping off. The pilot, 2nd Lt. Elmer Nelson, did not give the order to abandon ship. A few minutes later, from the result of flak, the plane split in half. The nose section of the plane was in a dive and traveling at at tremendous rate of speed. Neither Manicki or the other suvivor, radio operator Anthony Occhino, had any information regarding Thomas Raught’s fate. Thomas Earl Raught is listed on the Tablets of the Missing at Lorraine American Cemetery, Saint-Avold, France. To be continued with 384th personnel missing in action on missions in 1945. By thearrowheadclub in 384th Bomb Group on April 13, 2016 .